This one bedroom guest house over 2 car garage (currently used for living area) will make a great get-away and potential site to build your waterfront dream home! The guest home features a great room with large family area, a gas fireplace, access to a balcony with wonderful views of the Bay. There is a custom kitchen with granite counters and stainless gas range and appliances. The bedroom has a large walk-in closet and access to the balcony. The full bath was designed with Italian porcelain tile, and has double vanity granite sinks, and a deep soaking tub. Outside there is a finished 2 car garage with mini split HVAC unit, and additional half bath. The lawn is partially fenced and there is an inground heated salt water swimming pool, convenient storage building for lawn and water sports equipment, and a protected rip-rap shore line with private pier. The footing for a future 3 bedroom home has been poured in accordance to current plans by local home builder Randall Kipp. 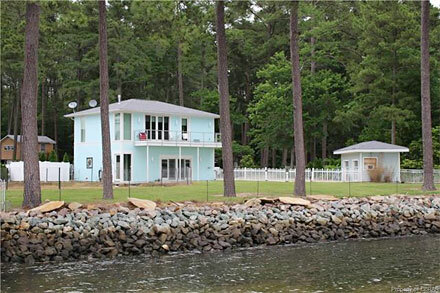 So, bring your fishing rod, crab pots, and swim suit while you consider all this property has to offer.